Today 1.5 billion people lack formal identification. Without identification, their economic opportunities are severely limited. Thousands of organizations, and governments all around the world are trying to deliver the critical and essential services in education, health, and finance needed to end poverty. Instead of deploying billions of dollars towards this fight, funds are getting wasted on challenges in identification. Enter Simprints, a startup that recognized that unlocking this identification bottleneck could change the lives of millions. Their guiding principle: every person counts. Confronting this opportunity head on, the team developed a mobile fingerprint scanning solution. This plug-in application was designed to be used by medics in the developing world, to access the digital health records of patients. Simprints set out to be a more attractive answer: resulting in being 228% more accurate, and 4x cheaper than other products on the market that are neither precise, affordable, or mobile enough. The technology has the advantage of integrating into major mobile platforms like CommCare, ODK, and OpenMRS, used by thousands of social-good organizations. Designed to scale from the start, it leverages ISO standard interoperability – meaning it can stand alone, or plug into existing systems like India’s Aadhaar scheme. It supports, rather than duplicates, government efforts. Smart leveraged Simprints’ knowledge of their patient population to streamline this experience and guarantee the easy retrieval of health records at each patient visit. As inclusive design specialists, we strove not to deliver effective and impactful design, but to guide Simprints on how to make it happen, empowering them with design capability. Smart involved Simprints in every design step along the way, including feedback across digital and physical touchpoints, and in defining the UX of the scanner and the app through a service design process. The system is now aligned to a seamless, holistic end-to-end user experience that can be implemented effectively by everyone involved – from the tech literate, to the inexperienced. To be truly effective where others were failing, they needed a design partner to bridge this ‘last mile’ on the frontline of healthcare, and ensure each and every medical interaction would deliver a tangible result. We have tested Simprints with more than 125,000 fingerprints across Zambia, Benin, Nepal, and Bangladesh. Recognized by the UNICEF & Tech Crunch Award for Best Tech, and Forbes 30 Under 30 Social Entrepreneurs, Simprints was awarded Business Weekly’s Startup of the Year. Put simply, “Identity is a fundamental right of every child. A cheap, open-source biometric solution like Simprints could become the first source of providing ID to hundreds of millions of children without identity now. It can allow these children access to services and protection from harm – something that they do not have today.” – Sharad Sapra, Global Director of UNICEF Innovation. 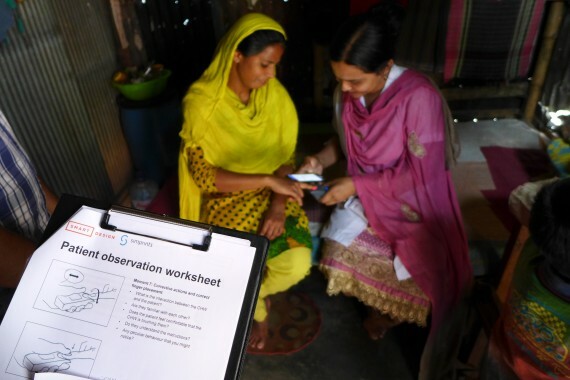 Earlier this year, Simprints was awarded the $2M innovation prize to scale their current project covering 22k patients in Bangladesh with BRAC—the world’s largest NGO—to scale nationwide across 24 districts, reaching 4.85M mothers and children over the next three years.